- Dropbox will drop API V1 support in June, we have implemented Dropbox V2 API in ATracker. If user has dropbox sync enabled in ATracker, Dropbox sync needs to be re-enabled in ATracker manually again, as Dropbox need to revalidate the user account access. More details can be found at http://www.Wonderapps.se/faq. -In "Today" tab, allow user to swipe left to edit task info and swipe right to create / modify / delete last task entry. -In piechart report, show more info on the graph. - Fixed Watch app with category filter. - Fix crash when user have watch app installed and started a task without icon assigned. - 24h calendar view added. - Allow user to select which calendar to save entries and allow user to override it on the task level. - Rewrite the Watch App, now it is native, and also add complication support. - Allow user to add category in the task form. Many features are included in this version. - Allow user to sort category. - Allow user to exclude category for reporting. - Only show category with active tasks in the filter. - Allow user to long tap the task in "Today" tab to edit current or latest entry of that task. For ATracker PRO and upgraded ATracker lite user, allow user to edit notes as well in "today" tab. - Allow user to long tap the entry in "history" tab to copy that entry / all entries of the day to today / tomorrow. - Export PDF instead of screenshot so it include all entries without trimming. - Support showing "unaccounted" when user selects "range"
- Show weekend date in red in barchart report. 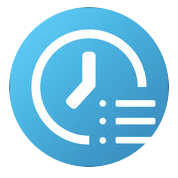 - Allow user to define date time format for CSV export. - Allow user to type in color code for task and category. - Add option to allow user to show seconds in ATracker. - Fixed Apple Watch app on notification handling. - Allow user to save /sync task entry back to main calendar. -Fix iOS 6 & 7 compatibility bug on Notes form. -Fix widget alignment bug on iPhone 6 plus landscape mode. - Various bug fixes and minor improvements. -iCloud sync disabled due to iCloud limitation and stability issues.